Never make fun of someone who speaks broken English. It means they know another language.” – H. Jackson Brown, Jr.
“Culture refers to the cumulative deposit of knowledge, experience, beliefs, values, attitudes, meanings, hierarchies, religion, notions of time, roles, spatial relations, concepts of the universe, and material objects and possessions acquired by a group of people in the course of generations through individual and group striving.” – Samovar and Porter (1994). Sociologists explain culture as knowledge or practices shared by a group that is relatively tougher for outsiders to access, understand or accept. Bingo! In the outsourcing world, this is the explanation that leaps to the eye when we refer to cultural barriers to outsourcing. This is also an excuse (yes, only an excuse) used by most managers when they explore the outsourcing option. However, whether you are outsourcing to a team in another country or working closely with your own team remotely, cultural barriers do apply. From the above categories, the one area that is certainly the most problematic is communication. In this blog, I will be focusing exclusively on how communication is the single-most critical factor for outsourcing success. While the other three areas are important, it is easier to combat them than the communication issue. Here are three reasons why communication is by far the most difficult cultural barrier to overcome, and what we can do to well, overcome it! 1. “When I said 3 PM, I actually meant 3 PM IST” – On time zones and physical limitations to communication. Let’s face it. Communication is difficult; especially when we are separated by continents and are speaking into that ludicrous microphone. Even when we say what we want to, the chances of it cutting through the static and making it across intact is pretty remote. Add to this mix the additional fact that it is well past bed time for either you or the person on the other end of the line—a sure recipe for disastrous communication! So how can you overcome time zone and other physical limitations to communication? The first step? When choosing a vendor or partner for outsourcing, ensure they have top notch infrastructure for communication. This usually includes facilities for video and audio conferences, access to a third-party industry standard conferencing facility like Webex, VoIP connectivity, and a dedicated line to ensure constant bandwidth. Whether you are a client or a partner in this equation, the next thing is to accept that in spite of global advances in technology, technical problems can crop up during phone calls, video conferences, or online chat. No, the partner is not doing it to vex you – there genuinely could be connectivity issues or bandwidth problems at that particular instance, which may be beyond anyone’s control. Just call back and apologize if your end of the communication dropped off. Or accept the apology graciously when the other person calls back. 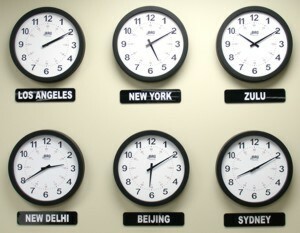 Hang a bunch of clocks in your office that shows the time in your time zone and that of the team at the other end. I cannot count the number of times I rush over to the main aisle at Suyati to check the time before I set up a meeting with my clients in the UK or US. Yes, I know I can google the time or have my calendar factor that in, but somehow seeing the time on that clock reassures me when I create the calendar invite. And yes, do ensure your admin sets the clock back or forward to account for daylight savings time! Now that we have got the physical limitations out of the way, how do we get past the next critical challenge – actual versus implied meaning? I would not define this as cultural – more of a work ethic issue on both ends. How do we overcome this? Set agendas – A good part of a project manager or a tech lead’s time is spent on setting agendas for meetings. And ensuring that the agenda is followed during a meeting. As a lead (either for the client team or the remote team), you need to set precise agenda for every touch point you have with your remote team. And ensure that the meeting is followed up by meeting minutes. A good statement of meeting minutes has the agenda, the details of the point discussed, the action items stemming from the point, the owners of the action item, and the deadline (if any) for the item. Whew! Yes, communication is hard work. But it pays off. The client wants status updates; and he wants it, like, yesterday! But you had sent one last week, and nothing much has changed since then. So why would you send it again? Unless something has turned critical, there is not much need to communicate, right? Wrong. At the beginning of your relationship, establish clear guidelines on the frequency of communication between your and your remote team. Set precise expectations – “I want email updates every week, preferably by Monday morning 8 AM EST” or “I will email the minutes of our daily stand-up meetings by EOD 7 PM IST”. You can never be too precise. Keep the lines of communication open – You expect frequent updates from your remote team? Then time to walk the talk yourselves. Email your remote team on a daily/weekly basis. Send information whenever possible when things change. New additions to the team? A celebration or anniversary? All great things to talk and email about. Sometimes our clients even email us the pictures taken at their team lunches. At all possible times, keep the lines of communication open. Set multiple lines of communication between you and your team. At Suyati, our team touches base with our clients through multiple team members and through multiple channels. At any given point of time during the day, there are group video conferences. Emails on project updates going back and forth. Daily phone calls. Skype chats. Tweets. You have endless channels of communication. Use them as wisely as possible. As Edward T Hall puts it finely, Culture is communication, communication is culture. Cultural barriers to outsourcing do exist. You cannot do away with them 100%. But with precise and frequent communication, you can just about afford to ignore the “cultural” part of outsourcing, while boosting efficiency, innovation and team morale. Want to see how Suyati helps clients technically achieve great heights? While scaling every cultural barrier possible? Get in touch with our CEO at mkrishna@suyati.com or tweet him @kmukund7.